In an old farmhouse dating from 1897, renovated in style, we offer a wide, 4 stars DTV classified apartment for a total of up to 10 people. In the 4 bedrooms and the large living room with fireplace and roof terrace will find all the space. In addition, we offer in our extension, the 'studio', another 4 bedrooms, some with private bathroom, for up to 8 people. Also here is a smaller, shared, fully equipped kitchen. 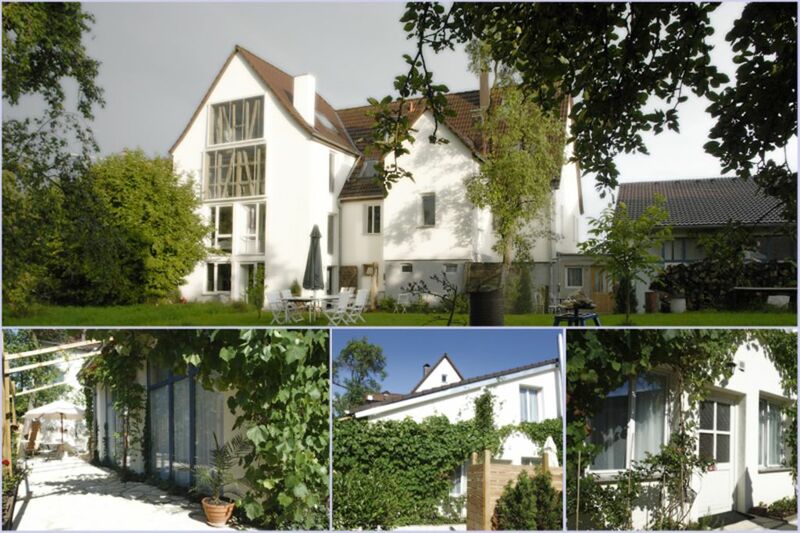 From our quiet house you have a wonderful view of the Swabian Alb and in large orchards. The house is surrounded by terraces and a pergola. Tübingen with its historic old town and the 500-year-old university is just a few kilometers away. In a short time you can reach both Stuttgart (airport) and the beautiful landscape of the Swabian Alb. The two parts of the house, farmhouse and studio, are connected directly to each other, but can also be used and booked separately. Price on request. Both units together are ideal for family reunions. Even for short-term stays for the weekend or on public holidays. In the village (Wankheim) there is a farmhouse festival barn, which can be rented for large celebrations. A few minutes walk away is a farm shop, bakery and butcher. The name 'Atelier-Wittke' was chosen because it also houses the studio of the painter and sculptor Cornelius Wittke. Original paintings hang in all rooms. The studio extension was the former sculptor's studio of the owner, therefore partly the large, reaching down to the floor windows. The single rooms and the garden room are practically barrier-free to reach. From Wankheim Stuttgart, the Swabian Alb, the Black Forest and Lake Constance (day trip) are easy to reach. The monastery Bebenhausen near Tübingen is situated on the edge of the large nature reserve Schönbuch. Many Castles (Hohenzollern) are worthwhile goals. About Tübingen itself as an internationally known historic university town one could enumerate many interesting things alone. There are several museums, a large movie times, theater, sports facilities and numerous cultural events. Tübingen has about 27,000 students. Here you can learn well what the city has to offer. In the kitchen-living room and in a triple room in. 1 Floor is installed a pleasant floor heating. Nice accommo in the country just 5kms from Tüb Stadtmitte. Room for 5 couples plus a few extras. Herr und Frau Wittke very friendly and receptive. Plenty of space, and all of the usual household stuff is provided - cutlery, linen, dishwashers, all of that. Nothing negative to say. Tübingen with its historic old town, university, castle, museums and many cultural institutions are always worth a visit. Several events, such. For example, the chocolART in December or the Umbrian-Provençal market in autumn attract many visitors to the old town of Tübingen. At the foot of the Swabian Alb and on the edge of the nature reserve Schönbuch, provide also for nature lovers many excursions. Die **** Ferienwohnung mit Belegung bis zu 8 Personen kostet pro Nacht 260 Euro. Das Atelier (2 DZ und 2 EZ) mit Belegung bis zu 6 Personen kostet pro Nacht 210 Euro. Jede weitere Person (Zusatzbett) 23 Euro. Freitag bis Sonntag kann die Ferienwohnung bzw. das Atelier jeweils nur komplett gemietet werden. Sonntag bis Freitag sind die Zimmer auch einzeln buchbar. (EZ ab 30 €, DZ ab 48 € pro Nacht, Mindestmietdauer 2 Nächte) Bei speziellen Wünschen Preise auf Anfrage. Es gelten unsere Stornobedingungen gemäß unserem Mietvertrag. Wichtiger Hinweis: Ab 22 Uhr muss außerhalb des Hauses (Terrassen, Pergolen) die Nachtruhe beachtet werden.